The cement industry scenario largely remains one of delayed demand revival, dismal realizations and surging costs. 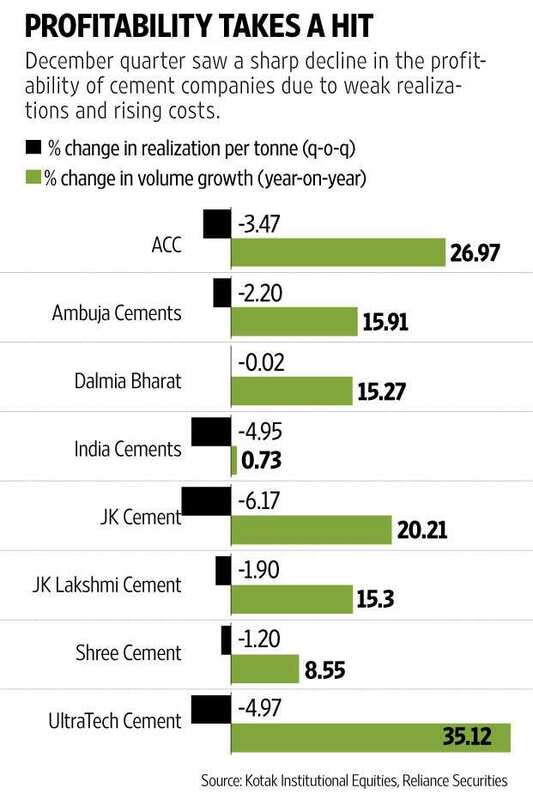 Nothing much changed for cement companies in the December quarter. The industry scenario largely remains one of delayed demand revival, dismal realizations and surging costs. Cement sales volume grew in double digits on a year-on-year (y-o-y) basis for many cement makers. However, one should not read too much into it, as growth was largely driven by a favourable base effect for most companies. This is also a reason why cement production data published by Department of Industrial Production and Policy showed that industry volumes increased by 20% y-o-y in December 2017. Industry volumes in December 2016 had declined by 8%. Weak realizations along with increased costs hit the profitability of cement makers. Prices of key input materials petroleum coke (petcoke) and coal continue to remain high. It should be noted that during the quarter the Supreme Court of India had banned petcoke usage in a few northern states in a bid to curb pollution. Though the restriction was relaxed later, it was followed by an import duty hike on petcoke from 2.5% to 10%. That hurt margins too. Also, increased diesel prices pushed freight costs northwards. While some companies did cut their fixed costs and changed the fuel mix to mitigate the impact on margins, largely realizations during the quarter belied forecasts, eroding overall operating margins. Going ahead, government spending on infrastructure and related projects will aid cement demand growth. Also, with the sand mining ban issue now getting resolved in states such as Uttar Pradesh, Bihar and Tamil Nadu, traction in demand is expected from the Central and South regions, but a turnaround is still a few quarters away. Given this environment, domestic brokerage house Kotak Institutional equities has cut its profitability assumptions for cement companies significantly for FY2019-20. “We still model an improvement in profitability in FY2019-20E versus FY2018 levels, which drives our net profit estimates for the cement sector. However, we would note that the sector has failed to meet with consensus estimates on profitability and earnings for the past few years," it said in its earnings review report. The ‘E’ stands for ‘estimate’. Unfortunately, the valuations at which cement stocks are trading have overlooked these concerns and they need to correct.